When it comes to platformers, the Nintendo Switch is great at delivering some of the best titles the genre has to offer. On Switch, you can find fantastic triple AAA games from Nintendo and some outstanding hidden gems made by indie developers. To that end, how does JackQuest: The Tale of the Sword hold up compared to other titles of the same genre? Is there any challenge to be had with it? And what does it bring to the table that makes it stand out? Story-wise, a happy couple named Jack and Nara venture out into the woods one night and settle down a camp for the day. After some singing, Nara is abruptly kidnapped by a massive green hand, which plunges her into the caverns below. Without hesitating, Jack jumps down the hole to save his love. Shortly after falling into the depths below, Jack finds a cursed sword named Kuro who claims he can help Jack if he breaks his curse. And that’s about all the story you’ll get. It’s your average run-of-a-mill damsel in distress plot that doesn’t get much more complex than what it already is. As most platformers go, you can move directionally, jump and attack with your selected weapon. There’s also a strong special attack you can use but it requires gems, an item that can be found by breaking crystals. There’s also hearts that grant the player more HP and players can heal using potions, which can be found inside breakable boxes scattered around the area (boxes also include coins). Boxes are near spikes or pits, and breaking a box makes the coins fly off into these deadly traps. The player usually gets only half of what the loot inside the boxes offer. The game has a good amount of checkpoints where you can respawn after dying, but these checkpoints don’t heal you after losing. This means if you get a checkpoint with half a heart left and die soon after, you’ll respawn with half a heart left. Unlike crystals, potion drops are rare and are hard to come across by. Combine the lack of potion drops and checkpoints that don’t heal, and you’ll soon realize this is the most annoying problem the game has. Jumping is essential for platforming, but the jump itself is somewhat clunky. When jumping you keep the forward momentum of the jump, making it tricky to stop quickly. Most of the time I went either too far from the platform I needed to get to, or I missed it by just a slight bit. If the player is near a ledge the jump button doesn’t trigger at times, so I fell off more times than necessary. The game offers a linear take on its “Metroidvania” inspired level design. The game is one complete area instead of level by level. There’s a few paths to go to from time to time but it’s mostly a one-way path. Throughout the game you’ll encounter uninspiring enemies like spiders, slimes and bats; which are easy to take down but deadly when with low HP. There’s also environmental traps like spikes, lava and spike balls that spice things up. Players can find hidden areas that are home to Hearts or Gems, which add one more slot to the corresponding area. There’s also torches that let the player save anywhere in the map. Players must face against bosses (the first two are bigger versions of an enemy) that have an insane amount of HP. The first boss isn’t hard to defeat because of its attacks, but the high HP makes it very tricky to defeat. After defeating a boss players unlock special upgrades like Wall Jump or Water Breathing, which made the game somewhat easier and more enjoyable to play. One of the unlockables is a map that the player obtains late game and it isn’t very useful. It’s hard to find things or search for paths since the viewpoint is way too zoomed in and there’s no way of seeing it as a whole. It would’ve been better if the map highlighted the areas where the player has already gone too since it makes finding new paths more accessible. The map itself is also obtained close to the end of the game and it’s not as useful as what it would’ve been if it were unlocked early on. There’s a total of thirteen achievements in the game, six of which will be automatically obtained by progressing through the game and another five can be completed within the first five to ten minutes of playing. This leaves the player with only two achievements remaining, and these are for those who want to 100% the game. Although it’s fun to obtain achievements, there’s not a lot of variety to make them challenging or worth a while. You’ll probably end up with eleven of the thirteen by the time you beat the game. Also, the achievements spoil the bosses designs and names which was kind of disappointing for me. There’s not a lot of dialogue in the game, as I said earlier the game isn’t focused on the plot. That being said, the writing is pretty bad. Some conversations felt incomplete or poorly written and the dialogue itself isn’t interesting either. There’s this character called “Stranger Man” who barely says anything comprehensive and there’s no context to his dialogue. Personally, I found these comments to be nonsensical and I was genuinely confused if the sword was either a hero or a villain and to top it all off, the ending is rushed and the adventure abruptly comes to an end as the credits roll. The camera is messy, especially when looking downwards. It’s focused on a perspective where there’s no way of seeing what’s underneath, pits or traps for example, unless you step close to a ledge. The process of getting to a ledge and waiting for the camera to lower down slows down the pacing of the adventure and although the camera goes down at ledges, there still are times where players can’t see the bottom. Falling from high places will almost always guarantee getting hit by something. What caught my eyes when playing JackQuest though, was its visuals. The pixel art design is nice and every enemy and item is well designed. The game’s background is an underground cave throughout the entire adventure, which is somewhat bland but still gets the job done for its atmosphere. As for the soundtrack, it is rather minimal as it offers only a handful of songs. Luckily, these themes are enjoyable to listen to and fit well with the cavern thematic. The level theme stands out the most as the track is diverse, pumped up and doesn’t get repetitive after a long time. With regards to pros and cons, on a positive side notes, are well designed levels, visuals and soundtrack. On the negative side however, there is clunky movement and camera angles, lack of difficulty, scarce amount of healing items and poorly written dialogue. Then of course, there’s a somewhat useless late game map, easy to complete achievements and little to no replayability after beating the final boss, which sadly, do diminish the overall appeal of JackQuest. 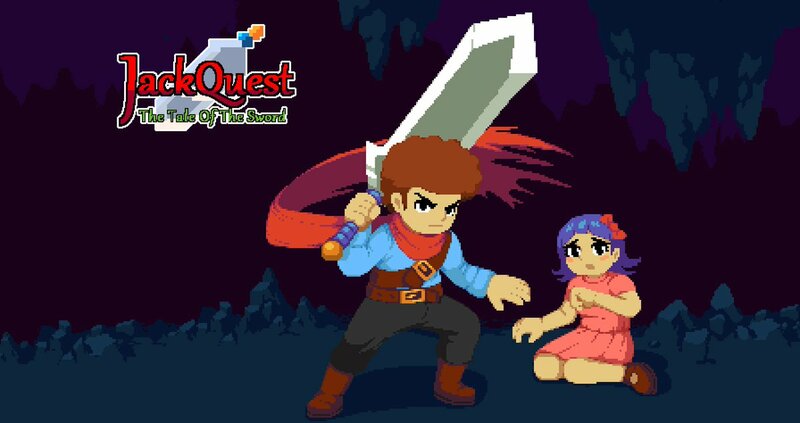 Ultimately, JackQuest: the Tale of the Sword doesn’t do a lot to stand out amongst the other platformers out there. There’s a lot of minor flaws and while on their own they would be insignificant, but together, they soon add up and for me, the overall experience wasn’t as enjoyable as it could have been. To make things, after the two-three hour long campaign does come to end and the credits roll, you’ll have practically seen and done everything that there’s no real need to go back and do it all over again, anytime soon.